The 14th Malaysian general election held on 9 May 2018 had concluded with the incumbent Barison Nasional (BN) voted out and Najib losing his Prime Minister position. Taking over the government is the opposition party with Dr Tun Mahathir Mohamad, a former Prime Minister of Malaysia, being sworn in as the 7th Prime Minister. Dr Mahathir is now 92 years old. 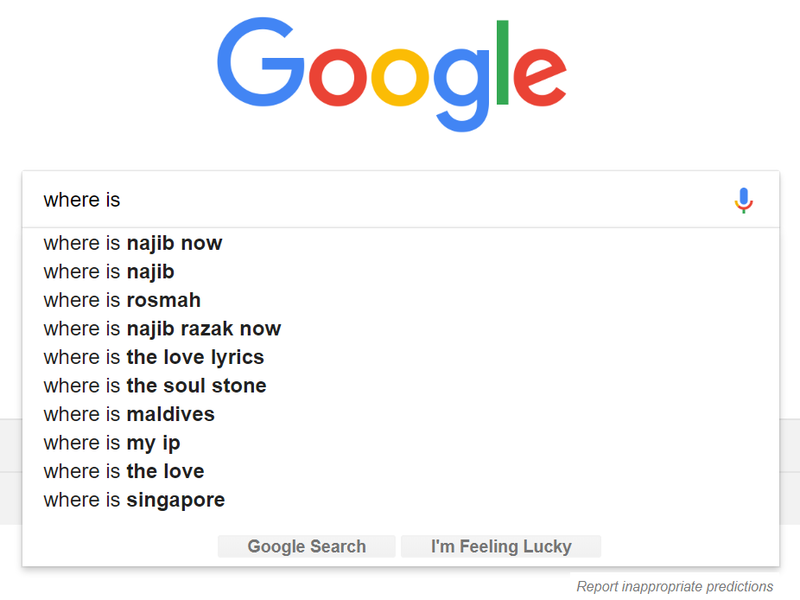 So where exactly is Najib and his wife Rosmah? 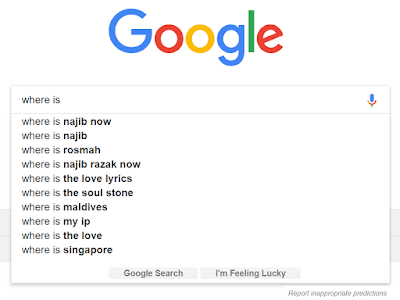 Even Google is showing the below when I type "where is". I bet many people are now searching for this. Watch North Korea leader Kim Jong Un becomes the first North Korean leader to cross the border dividing the two Koreas since the Korean War more than 60 years ago. Kim Jong Un met up with South Korean President Moon Jae-in for a historic summit. Kim walked towards the south, shooked hands with Moon at the border, crossed to the south, invited Moon to the north, both walked back to the north for a quick photo shoot before crossing back to the south again. All thanks to MasterChef UK, IKEA Singapore has just made Crispy Rendang Chicken possible! The wings are only available from 13 to 30 April at $9 for 6 pieces (not available for 2pcs and 4pcs). You may wish to check out IKEA restaurant for the other range of food and drinks provided too. How to check if your Facebook was shared with Cambridge Analytica? If you have never heard of the case of Cambridge Analytica with Facebook, then you must be living in some cave. Ever since the scandal was revealed, Facebook has started notifying up to millions affected. However, if you did not receive any notification from Facebook but would like to check if your Facebook account is affected, you may do so by going to the Facebook's help centre. The quick-and-easy utility from Facebook will tell you whether you or a friend of yours were affected. The Facebook check is here. NOTE: You will need to be logged on to Facebook before the check can be performed. You should see the following if your Facebook information was not shared with Cambridge Analytica. Rex Tillerson, now former Secretary of State for US, saying goodbye to his state of department - a man of high integrity indeed. Tillerson's speech followed after learning that he was fired over a tweet from President Trump. This can be a very mean-spirited town. But you don't have to choose to participate in that. Minister K Shanmugam asks Mr Simon Milner: Is Facebook willing to take down falsehoods? Minister K Shanmugam asks Mr Simon Milner, Vice President of Public Policy for Asia-Pacific for Facebook, whether Facebook is willing to take down falsehoods on its platform. The exchange took place at the 22 March hearing of the Select Committee on Deliberate Online Falsehoods. I'm not trying to be anyone saviour. I'm just trying to think about the future and not be sad. The Belt and Road Initiative is envisioned to enhance connectivity across continents through infrastructure investment, cultural exchange and technological know-how transfer. What are the implications for regional collaboration and the expansion of clean infrastructure? This session was developed in partnership with Caixin Media.